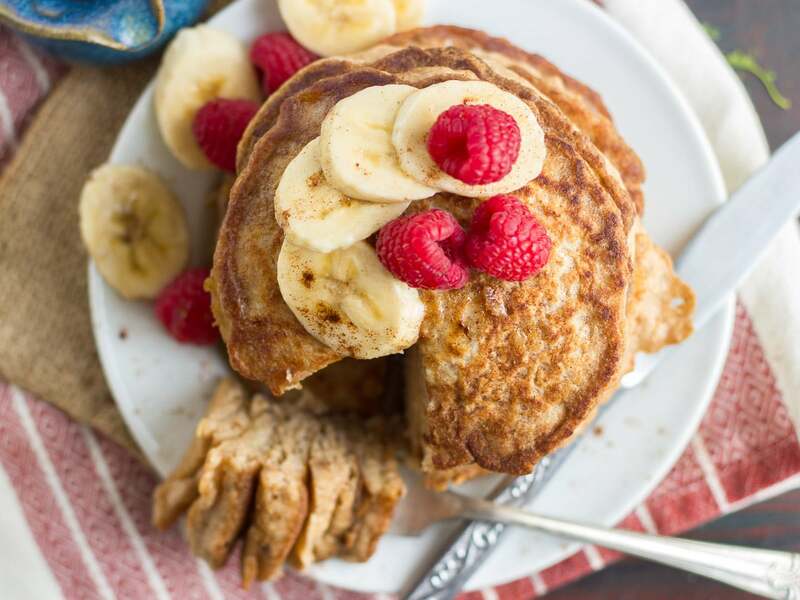 These fluffy vegan banana pancakes are infused with vanilla and toasty chai spices. 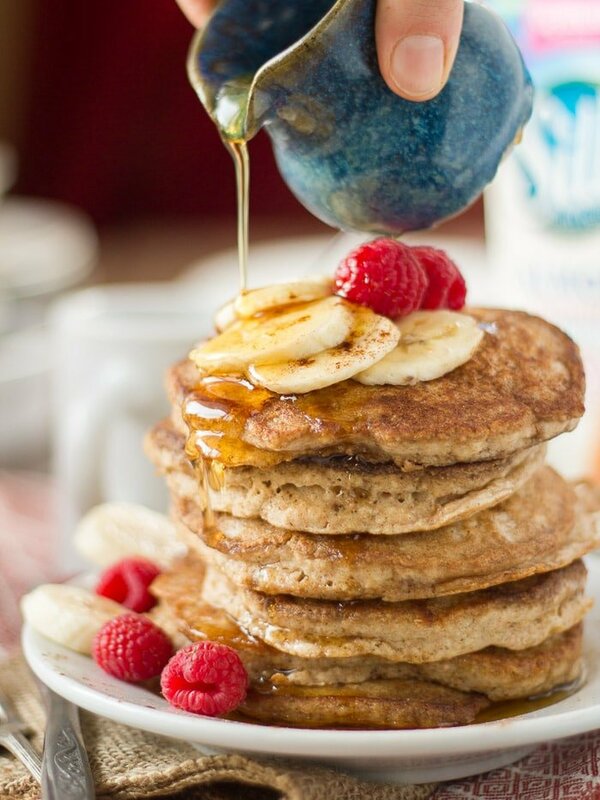 Serve them up with some fresh fruit and a drizzle of maple syrup for a cozy vegan breakfast! Holidays. The season of gingerbread everything. You want to know something? I didn’t really like gingerbread at all up until a few years ago. I love the spices, the molasses, lots of ginger, but all together, they can be a bit intense, unless you catch me at the right moment. So I decided to do something a little different this year. Gingerbread is my sometimes flavor, but chai is a flavor I love every single day. Chai’s got all the delicious spices we come to associate with holiday sweets, and then some, but softened up a bit, thanks to the sweet and mellow flavor of vanilla. 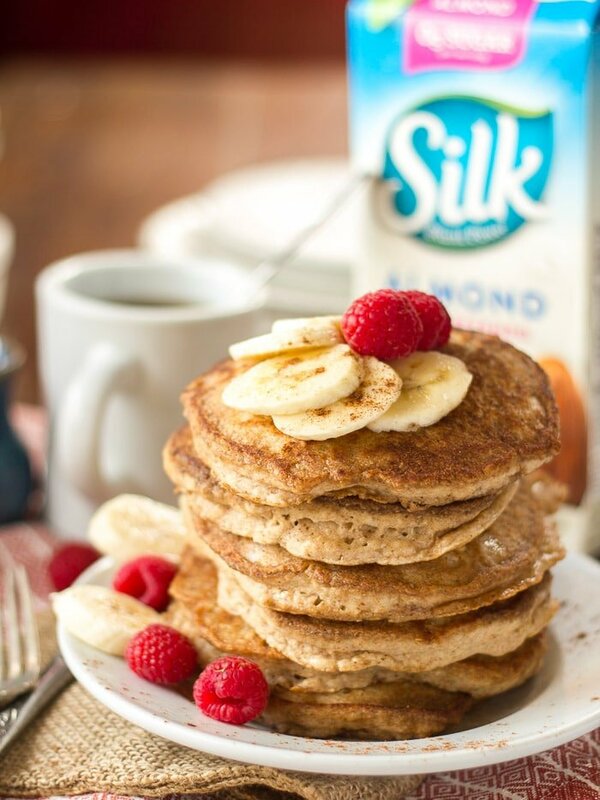 Vanilla chai vegan pancakes? 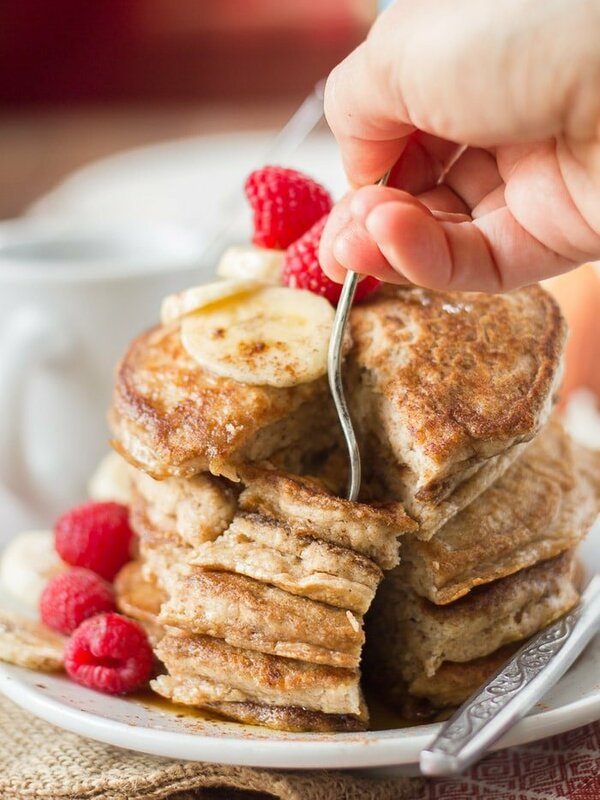 Better yet, vanilla chai vegan banana pancakes. Yes! Banana + vanilla is a match made in heaven. This is my the last in my series of posts as a 2016 Silk ambassador. I thought my vanilla chai vegan banana pancakes would be the perfect opportunity to celebrate Silk’s Unsweetened Vanilla Almondmilk. I usually keep unflavored Almondmilk or Soymilk around, but since I wanted to give these pancakes a heavy dose of vanilla flavor, I went with vanilla flavor. I stuck with unsweetened, because the bananas add plenty of sweetness for me, but you could go with sweetened if you’d like something a bit sweeter and more indulgent. Silk also sent me a couple new products to try out. They’re rolling out some new Protein & Nutmilk blends, made from a base of almond and cashew milk, with added pea protein. I received a sample of vanilla and plain (with just 2 grams of sugar). I’ll probably use one of them for my next batch of pancakes, but for now really I’m enjoying drinking them. They’re just as creamy and delicious as all of my favorite Silk varieties, but with the added bonus of 10 grams of protein in an 8 ounce serving, which makes me very happy. You can use Silk’s store locator to find out where you can get some of their Vanilla Almondmilk for this recipe. 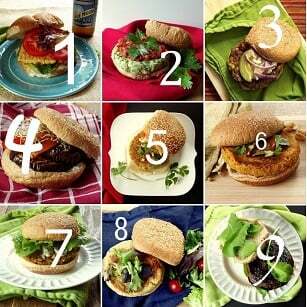 For more delicious dairy-free ideas, sign up for Silk’s newsletter here. Place the banana into a large mixing bowl and mash well with a fork. Stir in milk, coconut oil and vanilla, until ingredients are well blended. In a separate bowl, stir together flour, baking powder, cinnamon, ginger, nutmeg, cloves, cardamom and salt. Add dry mixture to wet, stirring until well blended. Coat the bottom of a nonstick frying pan lightly with oil and place over medium heat. Once the pan is hot, drop 1/4 to 1/3 cup of batter into the center. Cook until the batter begins to brown around the edges, about 3 to 4 minutes. Flip and cook about 2 minutes more, until lightly browned on bottom. Repeat until all batter is used. You can also use an equal mix of all-purpose and spelt flour. Now you have me craving fluffy pancakes! Is it Saturday morning yet? I can not emphasize enough how much I LOVE chai anything. I must make this! Me too!! I hope you enjoy them! Perfect recipe! Thanks! Made them quite a few times now and have experimented with different flavours and add ins, all worked well. I do half all purpose and half whole wheat flour. Thanks Jana! I’m so glad you’re enjoying them! any ideas for substitutes on the ap flour? Whole wheat pastry and spelt usually work as substitutes for me. If you’re looking for a gluten-free option, I like Bob’s Red Mill one-to-one blend. I just made these. I used an equal mix of AP flour, Spelt flour and 1/4 cup vegan protein powder. The pancakes came out very thick but cooked through and tasty. I live in a dry climate, and it’s the middle of the winter, so I might tweak the recipe to make it a bit more liquidy. Any suggestions? Less flour, more milk? Glad you enjoyed them! I’d try adding a some additional milk – maybe just a tablespoon or two per batch until you’re happy with the results! These were amazing! I was able to use a mix of 1/2 cup AP flour and 1 cup wheat flour. I also found that my second and third batches came out fluffier because the baking powder had more time to activate. Definitely will make these again! !